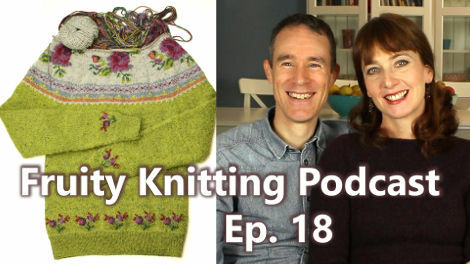 In Episode 18 of the Fruity Knitting Podcast, we’re looking at a few knitting challenges. Marie Wallin is putting Andrea’s technique to the test. Fair Isle is normally done in the round, but Marie Wallin’s Amaryllis uses fair isle in the flat. 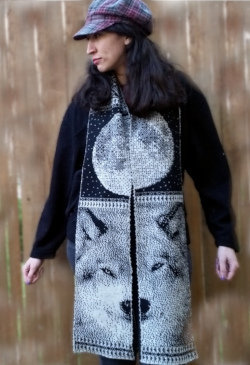 Andrea shows us how to fair isle on the purl side. 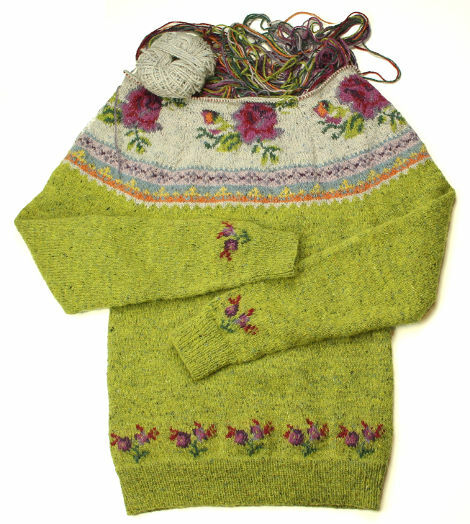 Intarsia is normally done in the flat, but Marie Wallin’s Blossom uses intarsia in the round – which is making some trouble. We get a bit nostalgic and confront a boyfriend sweater problem. It’s serious stuff. 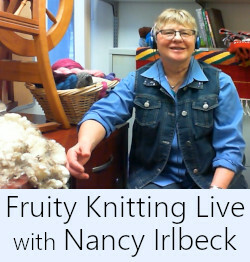 But we also celebrate the successes of our First Garment and Fair Isle Garment KAL participants – in technicolor video. 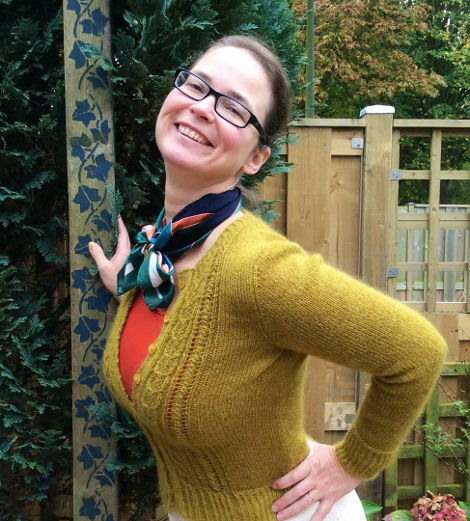 And we travel to Amsterdam to meet Dutch Jacky, our guest on Knitters of the World. We hope you enjoy it. 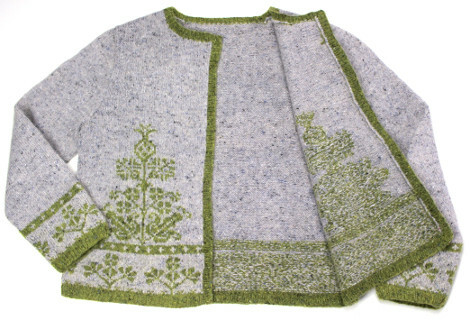 The Blossom design by Marie Wallin includes some fair isle in the yoke, but the rose buds above the band and cuffs and the full roses at the top of the yoke are done in very intricate intarsia. Whereas fairisle is generally limited to two colors in any row, with intarsia you have a single yarn for each vertical section of color. With five roses around the yoke and many sections of different colors in each rose, that makes for a lot of individual bits of yarn. 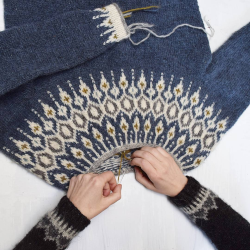 Another contrast between the fair isle and intarsia techniques is that fair isle is commonly done in the round, whereas intarsia is normally done in the flat. Purling in fair isle is considered difficult. 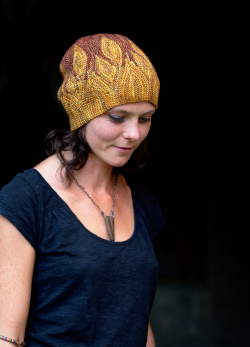 With intarsia, purling actually helps because it ensures that your yarn is where you need it on the next row. When knitting in the round, the yarn tends to be left on the “far” side of the section of color, so you need to bring it back to start that block again. There are some techniques for handling intarsia in the round. One, which I kind of understood, involves slipping the stitches of the intarsia section onto the other needle, then purling that section, then slipping the stitches back – something like that! There is apparently another method, but I didn’t pick that up at all. 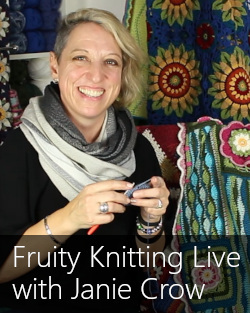 Marie Wallin recommended that knitters learn to fair isle on the purl side for the versatility in her interview in Episode 17. 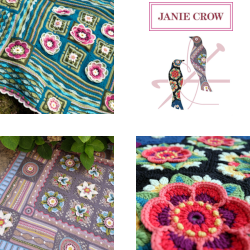 Andrea has been following “Dutch Jacky” on Ravelry for a few years due to their shared admiration of Kim Hargreaves. Jacky is a regular at Stephen West’s knitting evenings and has earned a position as his personal test knitter. Jacky’s work can be admired at Stephen’s trunk shows. Hi Ruth. Andrea says she’ll use just about any needles – I do joke that she uses two sticks from the garden. I pushed her and she said Chia Goo (spelling – sorry). My tip would be to send / take the needles back if you have problems. Sometimes the joins are bad on a particular pair even if the brand is in general ok. Cheers, Andrew. I just had to watch the episode of the 50’s US TV show “Ozzie and Harriet”. I was vry young, but of course had a crush on Ricky Nelson. At the time, his hairctlyye was “daring”. i don’t recall this episode, but the show was watched faithfully in black and white. Do you realize that the actor playing the guy with the girlfriend named GINger was Micky Rooney (a child actor who went on the act his entire life, mostly as a comedian, lived to a ripe old age. Ozzie and Harriet Nelson and Rickand Dave were a real family and used their real names. As Ricky got older, he got cuter, and recorded a hit single “Hello MaryLou”. He married his girlfriend Chris. They had 2 twin sons (Gunnar and ? ), and a daughter, Tracy Nelson (actress). Rick died in a plan crash when his children were young. It was a sad time for all. p.s. typos in previous post, this is a very small font. I was hoping you would post the source of the Ozzie and Harriet Episode (number, date). Hi Andrew and Andrea, at the moment I am watching this episode(18), and I can see the problems you’re having with the full blooms on the upper edge of the sweater. 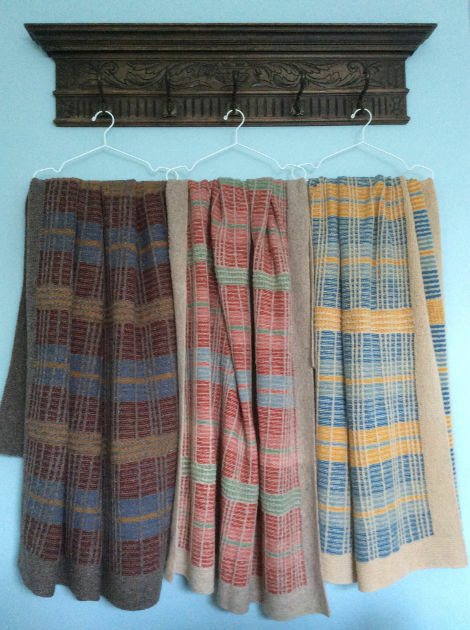 Another solution would have been to swiss darn them on the knit fabric. Mostly I hear people in other countries(other than the Netherlands) talk about swiss darning to attach one piece of knitting to another but Swiss darning is also a method to embroider your knitting. 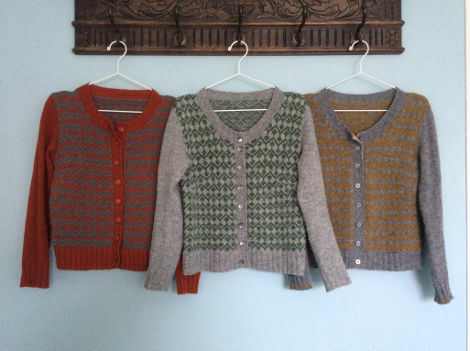 On my ravelry page I have a child sweater called “strand trui” which has been swiss darned. viool46 is my ravelry name. sorry, should have watched the whole episode first.